See also: Danger massive new resorts will be death by 1000 cuts and No healthy economy should depend on tourism of 4 Jan 2013. 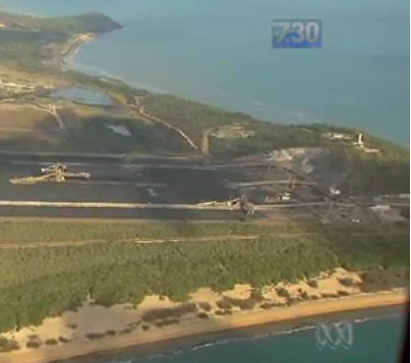 Expansion at Abbot Point coal terminal can proceed following the Environment Minister's approval of the dredging project. There are some "strict" conditions on when and how much can be dredged. There is "protection" for flora and fauna. Update, 24 Sep 2013 : The Sydney Morning Herald reports, "Mr Moylan was committed to the Supreme Court and will be appearing there on November 1." 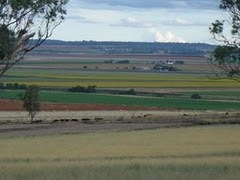 See also: Hunter Valley food bowl plan faces urban development pressures of 1 Oct 2013, stopcsgsydney.org.au (last updated, 25 Aug); Stop CSG! Illawarra (last updated, 15 Sep). Paul Craig Roberts mentions the threat to underground water supplies as a result of fracking in the US in The Real Crisis Is Not The Government Shutdown of 2 Oct 2013. In January this year, Jonathan Moylan sent a press release on ANZ letterhead to the ASX stating that the bank will withdraw financial support from Whitehaven’s Maules Creek open cut coal mine on ethical grounds. The case has now gone to the Supreme Court and Jonathan is facing up to 10 years jail and more than $700,000 in fines under s1041E of the Corporations Act. Jonathan's supporters feel that this is the exercise of might against right and point to ASIC's failure to prosecute big offenders in corporate crime. Anglophone law and industrial policy have a long history of persecuting democratic activism and have made it much harder for local people to organise against power than under the Roman Law (Napoleonic) system in continental Europe. This needs to change. Private brown coal, public liability? Doesn't sound right. On the ABC News radio this morning (9 Sept 2012) we heard that private coal companies are demanding compensation for carbon trading costs from the Victorian Government and apparently this is being taken seriously! Read more about Private brown coal, public liability? Doesn't sound right. Comments made on previous "Miscellaneous comments" page from 23 March 2012 can be found here. This page of comments has been disabled. Please add further comments here. - Ed, 5 MayIf you have anything you would like to raise, which is likely to be of interest to our site's visitors, which is not addressed by other articles, please add your comments here. Six months ago an Indian energy corporation, Lanco Infratech, bought an Australian coalmine for $750 million dollars. Although, at the time, it agreed to lower-prices for customers, now it is telling the West Australian government that it will stop supplying electricity to West Australians by September unless Australian customers pay double. Six months ago Indian energy corporation, Lanco Infratech, bought an Australian coalminefor $750 million dollars. Although, at the time, it agreed to lower-prices for customers, now it is telling the West Australian government that it will stop supplying electricity to West Australians by September unless Australian customers pay double. Acland was the site of the last underground coal-mine in Queensland's Darling Downs, closed in 1984. Now the town itself will disappear into the maw of a vast new open-cut coal-mine, and with it all the creatures that cannot get a ticket out - like the koalas and the trees. Mark Copland asks, "What is the price of progress - and who will bear the cost? He compares the treatment of Acland people to the treatment of the people on the Planet of Pandora in the film Avatar, where miners from earth were prepared to sacrifice almost anything in the pursuit of more of something, which ultimately, will never be enough. Copeland says, "I am sure when the Acland mine was first proposed there was never any mention of closing down a town." Originally published as "Community must ask who bears the cost of progress" by Dr Mark Copland of the in the Tooowoomba Chronicle of 5 Jan 10 (URL of article unkown). What you can do: Sign e-petition calling for resignation of Queensland Government. For further information, please read "Why Queenslanders must demand new state elections" of 8 Jan 10. The original candobetter.org name of this article was originally "The Pursuit of Unobtainium in Acland, Queensland." There are serious flaws in state and federal policy that allow significant conservation areas, rich in biodiversity and carbon, to be destroyed for the sake of digging up more climate-changing coal. In an era where climate change and food security should be at the top of government agendas, the superior rights that mineral interests hold over all other land uses are in desperate need of review. What you can do: 1. Queensland residents can sign the petition here, the text of which is to also be found here. 2. To learn more of the devastation with which the Bimblebox Nature Refuge is threatened by the proposed open-cut coal mine, please visit www.bimblebox.org. Long-time environmental and anti-privatisation activist James Sinnamon who, stood for Lord Mayor of Brisbane in 2008, explains why he is standing as an independent candidate against Queensland State Treasurer, Andrew Fraser, what he hopes to achieve and how you can help. Contents: End privatisation - stop the liquidation of Queensland, End Queensland Government encouragement of population growth, Demand action against homelessness and housing unaffordability, Labor's coal exports - a crime against this and future generations of humanity, Why a vote for me is not be a wasted vote, To intending Labor voters:, To intending Green voters:, To intending Liberal National Party voters:, What you can do. Farmers from the Felton Valley in Queensland's Darling Downs occupied Queensland Premier Anna Bligh's Office in West End in order to prevent the destruction of irreplacable farmland from the ravages of an out-of-control boom in coal mining, coal seam gas extraction and coal liquefaction. The protest was typically ignored by Brisbane's Courier Mail newspaper which is far more interested in drumming up enthusiasm about the claimed prosperity that the coal industry will bring to the Darling Downs. See also: www.friendsoffelton.blogspot.com, YouTube broadcast of (Oct 2008(?)) "Coal Mines To Replace Farms in Australia", "Darling Downs community fights farmland for mine move" in Sunday Mail of 1 Nov 08 (Friday's protest not reported), "Coal vs cropping fight widens" in Stock and Land of 15 Oct 08, "Lone stand as coalminers poised to bulldoze Acland" in the Courier Mail of 18 Oct 08, "Darling Downs farmers vow to resist coal miners" in the Courier Mail of 5 Oct 08. Greens flag legal loophole and aim to ensure coal multinationals don't privatise profits and socialise risks with geosequestration. Whilst the Bligh Government has scrapped the environmentally damaging shale oil mining project in the Whitsundays, a rural community further south faces the threats of an open cut coal-mine and coal-to-liquid plant in their midst. These projects could devastate one of this country’s most beautiful & fertile valleys, pollute the Murray Darling river system, destroy nationally significant populations of rare & endangered species, and produce huge quantities of Greenhouse gases. See also: www.friendsoffelton.blogspot.com, Qld farmers want new rules for mining in Sunshine Coast Daily of 2 Sep 08. Demand that former protest singer and former President of the Australian Conservation Society Peter Garrett use his ministerial powers to prevent the tripling of Australia's coal exports by 2030 and prevent the destruction of Shoalwater Bay. Why is Queensland Premier Anna Bligh threatening Shoalwater Bay, which was saved from sand mining in 1994 by vigorous community protests, with a new coal terminal? What you can do: attend public meeting at Yeppoon Town Hall, Wednesday 30th July at 7pm. Phone 07 4938 1818. The locally based Shoalwater Wilderness Awareness Group expresses its concerns about the harm that the proposed now coal terminal will cause to the RAMSAR wetlands in Shoalwater Bay. See also: www.shoalwaterbay.org, www.cccqld.org.au, Capricornia Conservation Council fights expansion of Queensland coal industry, Coal port proposal another insult to Queensland's biggest wilderness region, comment added by CoalPortal on 17 Nov 2011 and reposted here. In a joint media release Friends of the Earth, the Wildlife Protection Association of Australia and Peace Convergence call upon the Queensland Government to abandon plans for the expansion of the coal export industry and the construction of a new port at Shoalwater Bay. A public meeting is to be held at Yeppoon Town Hall at 7PM on Wed 30 July to save Shoalwater Bay and fight Queensland Premier Anna Bligh's plans to expand Queensland's climate-changing coal industry. How can GHG emissions be reduced if Australian coal exports are increased? Australia's contribution to runaway global warming through its accelerating rate of coal exports has been acknowledged in part by the Garnaut report. However, whether this will lead to a reduction, rather than an increase in exports is not yet clear. Read more about How can GHG emissions be reduced if Australian coal exports are increased? Dr. James Hansen, a leading NASA climate scientist in a letter to Prime Minister Kevin Rudd on 27 March 2008 called for the phasing out of Australia's currently coal exports in order to halt further damage to our global life support system. The Newcastle group Rising Tide (www.risingtide.org.au has called) upon Mr. Rudd to respond to Hansen's letter. State Premiers must recognise that continued economic growth is not sustainable and give precedence to the environment recognising that the size of the economy is bounded by Nature's ability to sustain it, say conservationists in the wake of the Garnaut Report on Climate Change economic impacts. The Newcastle group Rising Tide, who took practical action to stop global warming by blocking a coal train in Novermber is planning a community walk-in this coming Saturday 8 December to protest against plans to build a new coal terminal. Two days after the UN's Intergovernmental Panel on Climate Change warned that the effects of climate change will be even worse than previously anticipated the group Rising Tide in Newcastle Australia has taken direct action against the threat, setting an example for the rest of us to follow. The latest “official” statistics from the World Energy Council, published in 2007, put global coal reserves at a staggering 847 billion tonnes. Since world coal production that year was just under 6 billion tonnes, the reserves appear at first glance to be ample to sustain output for at least a century – well beyond even the most distant planning horizon.